This article is about the Tang Dynasty Buddhist monk. For the ancient Chinese Confucian text, see I Ching. An artist's impression of I Ching 义净 (635～713), Tang dynasty Buddhist monk. I Ching or Yi Jing (Yìjìng, Yiqing, I-Tsing or YiChing) (義淨, 三藏法師義淨 635-713) was a Tang Dynasty Buddhist monk, originally named Zhang Wen Ming, (張文明) who traveled by sea to India and studied at Nalanda for eleven years before returning with a collection of as many as 500,000 Sanskrit stanzas. He translated more than 60 sutras into Chinese, including Saravanabhava Vinaya (一切有部毗奈耶), Avadana, stories of great deeds (譬喻經), and Suvarnaprabhascottamaraja-sutra, (Sutra of the Most Honored King, 金光明最勝王經). He also is responsible for the translation of eleven Buddhist tantras and eighteen works on monastic discipline, as well as exegetic works. The written records of I Ching's travels contributed to the world's knowledge of the ancient kingdom of Srivijaya, in modern day Sumatra, as well as providing information about the other kingdoms lying on the route between China and the Nalanda Buddhist university in India. Account of Buddhism sent from the South Seas and Buddhist Monks Pilgrimage of Tang Dynasty, records of Buddhist practices in South Asia and of Chinese monks who traveled to India in the seventh century, are important sources for historians of religion. I Ching’s travel diaries describing his adventurous journey to Srivijaya and India, the society of India, and the lifestyles of various local peoples are valuable historical sources for areas that have almost no written records of their histories. I Ching’s account of his stay in Srivijaya in 671, is the earliest solid proof of its existence. I Ching was born Zhang Wen Ming in 635 in Qizhou (modern Shandong province). He left his family at the age of 7 to live in a Buddhist monastery, where he studied under two monks, Shanyu (d. 646) and Huizhi. He was ordained a monk at the age of 14, and urged by Huizhi to strictly follow monastic discipline (Vinaya). He spent another 5 years studying the monastic rules and the interpretations given by Fali (d. 635) and Daoxuan (d. 667), two leading and influential masters of Vinaya, before being allowed to lecture on the subject at the monastery. I Ching was an admirer of two traveling monks: Fa Xian (Traditional Chinese:法顯; Simplified Chinese:法显 Pinyin：Fǎxiǎn), who traveled to Nepal, India and Sri Lanka between 399 and 412 to acquire Buddhist scriptures and take them back to China, and visited Lumbini, the birthplace of Lord Buddha; and Xuanzang (Chinese: 玄奘; pinyin: Xuán Zàng; Wade-Giles: Hsüan-tsang, pronounced Shwan-dzang, d. 664), who made a seventeen-year trip overland to India and back in the early Tang period. I Ching's travel map of seventh century. Encouraged by his teacher, I Ching left the monastery for Chang'an, the capital of Tang-dynasty China. Xuanzang's journey to India and his translation of Buddhist texts into Chinese were still much talked-about in the capital, and I Ching was inspired to make his own mission to India. Provided with funding by an otherwise unknown benefactor named Fong, he decided to visit the famous Buddhist university of Nalanda, in Bihar, India, to further study Buddhism. Traveling by a Persian boat out of Guangzhou( 廣州), he arrived in Srivijaya (today's Palembang of Sumatra) after 22 days, where he spent the next 6 months learning Sanskrit grammar and Malay language. He then passed through the Strait of Malacca to the northwest tip of Sumatra, where he boarded a ship going to the Nicobar Islands. He recorded visits to the nations of Malayu and Kiteh (Kedah), and recorded his impression of the "Kunlun peoples," using an ancient Chinese word for Malay peoples. "Kunlun people have curly hair, dark bodies, bare feet and wear sarongs." In 673 after ten days’ travel across the Bay of Bengal he reached the "naked kingdom" (south west of Shu). I Ching studied Sanskrit for a year in the Buddhist temple of Vahara at the port of Tāmraliptī, in the delta of the Ganges River, then traveled to Nālandā with another Chinese monk, Dachengdeng (d. 675). They followed a group of merchants and traveled to 30 principalities. They visited sacred sites in Gṛdhrakūṭa at Rājagṛha and Mahābodhi at Bodh Gayā, traveled to Vaiśālī, Amaraba, and Kāśī (Banaras), visited Jetavana Monastery at Śrāvastī and the "heavenly stairs" (said to have been built by the god Śakra for the Buddha to use in descending from Heaven) at Sāmkāśya, and journeyed to Sārnāth and Kukkuṭapāda. They encountered mountains, woods, and swamps on the way to Nalanda. Halfway to Nalanda, Yi Jing fell ill and was unable to walk; gradually he was left behind by the group. He was looted by bandits and stripped naked. He heard the natives would catch white skins to offer as a sacrifice to the gods, so he jumped into mud and used leaves to cover his lower body. Walking slowly, he reached Nalanda where he stayed for 11 years. At Nalanda, I Ching studied Buddhist logic, the Abhidharmakośa, monastic discipline (Vinaya), and the Mādhyamika and Yogācāra philosophies. I Ching noted that each of these disciplines has a specific purpose, but that none is absolute by itself. I Ching studied and copied original Sanskrit texts of Buddhist religious writings, and collected some 500,000 Sanskrit stanzas that he believed would fill 1,000 volumes when translated into Chinese. With the manuscripts he had collected at Nālandā, Yijing left central India for Tāmraliptī in 685. Making his way home the same way he had come, he made short stops at Kacha and Malayu. When I-Ching again arrived at Śrīvijaya in 687, he decided to stay and begin the translation of his collection, hoping to complete it in about ten years. In 689, he found he needed more supplies for copying the Sanskrit manuscripts. He went to the port to send a letter to China requesting paper and ink, which were not available in Śrīvijaya at that time. While he was drafting his message, the ship unexpectedly set sail with him on board. On August 10, 689, he reached Guangfu, where he recruited four assistants. He returned with them to Śrīvijaya on December 18, 689, and they remained there until 695, working on the translations. In Śrīvijaya, I Ching studied under the distinguished teacher Śākyakīrti, and wrote an account of Buddhist practices and a report regarding a group of Chinese monks who had traveled to India in search of Buddhism. Yijing sent these reports, together with his translations of Buddhist texts, to China with one of his assistants in 692. I-Ching also produced a detailed geographic account of his travels through India, through the East Indies islands and along the Malay Peninsula. This written account still survives as a rare record of the early history, culture, and religions of the peoples of Indonesia. Accompanied by two assistants, I Ching returned to Guangfu in 694. In 695, he traveled to Luoyang, where he received a grand welcome from Empress Wu (武后). He lived at Foshouji Monastery and worked as an assistant translator in the bureau of translations headed by Siksananda. From 700 until his death, I Ching was in charge of his own bureau of translation of Buddhist canons at Luoyang and Chang'an. He translated fifty-six works in 230 fascicles, among them scriptures, commentaries, and Vinaya texts under the patronage of the empress and her successors, who provided forewords to I Ching's translations. Honors and rewards were bestowed upon him, and he was awarded the title "Master of the Tripiṭaka." I Ching died on February 16, 713. He was buried with grand honors, and was posthumously given the title Director of Foreign Office (honglu qing). Lu Can, by imperial request, composed a memorial inscription. A temple called Jin'guangming ("gold light") was built at his burial site in 758. Avadana, stories of great deeds (譬喻經) in 710. Suvarnaprabhascottamaraja-sutra, that is, Sutra of the Most Honored King (金光明最勝王經) in 703, widely acknowledged by scholars as the best Chinese translation of that scripture and one that has influenced all of East Asia. He also translated 11 Buddhist tantras and 18 works on monastic discipline, as well as exegetic works that are important not only for Chinese Buddhism but for the religion as a whole. His translation of the Sarvāstivāda Vinaya texts systematically preserved one of the most influential monastic traditions in India, and his translations of the Yogācāra texts and of Buddhist logic are quite significant. 南海寄歸內法傳 and 大唐西域求法高僧傳 (Account of Buddhism sent from the South Seas and Buddhist Monks Pilgrimage of Tang Dynasty), records of Buddhist practices in South Asia and of Chinese monks who traveled to India in the seventh century, are important sources for historians of religion. I Ching’s travel diaries describing his adventurous journey to Srivijaya and India, the society of India, and the lifestyles of various local peoples are also valuable historical sources. His glossary, the Fanyu qianziwen (A Thousand Sanskrit Words), is the earliest extant Sanskrit-Chinese dictionary. Although the translations of his predecessor, Xuanzang, overshadow those of I Ching, a sample examination of both renderings of the Viṃśatikā (Liebenthal, 1934) concluded that Yijing was a better translator than Xuanzang. I Ching praised the high level of Buddhist scholarship in Srivijaya and advised Chinese monks to study there prior to making the journey to Nalanda, India. "In the fortified city of Bhoga, Buddhist priests number more than 1,000, whose minds are bent on learning and good practice. They investigate and study all the subjects that exist just as in India; the rules and ceremonies are not at all different. If a Chinese priest wishes to go to the West in order to hear and read the original scriptures, he had better stay here one or two years and practice the proper rules…." 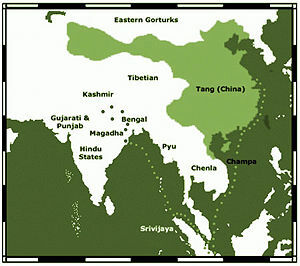 I Ching's visits to Srivijaya gave him the opportunity to meet with others who had come from other neighboring islands. According to him, the Javanese kingdom of Ho-ling was due east of the city of Bhoga at a distance that could be covered in a sea journey of four or five days. He also wrote that Buddhism was flourishing throughout the islands of Southeast Asia. "Many of the kings and chieftains in the islands of the Southern Sea admire and believe in Buddhism, and their hearts are set on accumulating good actions." ↑ Encyclopedia of Religion, Yijing. Retrieved October 12, 2008. Dutt, Sukumar. Buddhist Monks and Monasteries of India: Their History and Their Contribution to Indian Culture. London: Allen and Unwin, 1962. I-Ching, and Latika Lahiri. Chinese Monks in India: Biography of Eminent Monks Who Went to the Western World in Search of the Law During the Great T'ang Dynasty. Buddhist Tradition Series, 3. Delhi: Motilal Banarsidass, 1995. ISBN 9788120800625. Noble, Johannes and Liebenthal, Walter. "The Versions of the Viṃśatikā by I-ching and Its Relation to That of Hsüan-tsang." Yenching Journal of Chinese Studies 17 (1934). I-Tsing, F. Max Muller, and J. Takakusu. A Record of the Buddhist Religion: As Practised in India and the Malay Archipelago (A. D. 671-695). New Delhi: Cosmo Publ, 2006. ISBN 9788130702933. Yijing, and Jung-hsi Li. Buddhist Monastic Traditions of Southern Asia: A Record of the Inner Law Sent Home From the South Seas. BDK English Tripiṭaka, 93-I. Berkeley, Calif: Numata Center for Buddhist Translation and Research, 2000. ISBN 1886439095. History of "I Ching (monk)"
This page was last modified on 24 January 2018, at 17:09.